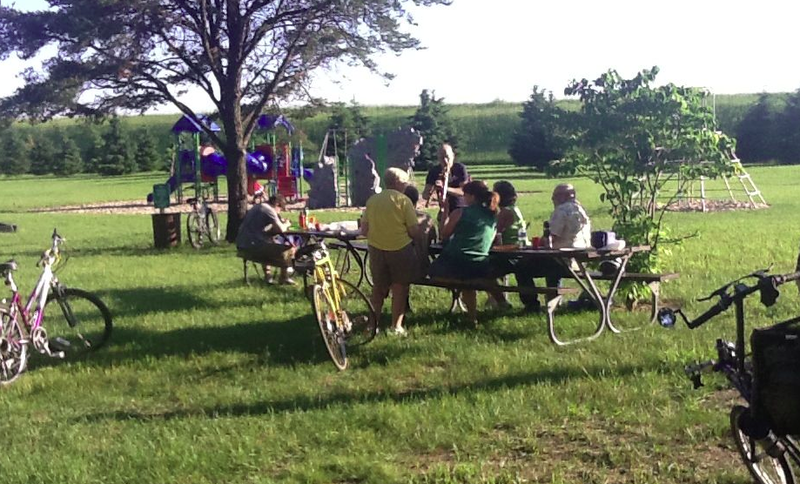 The Poky Pedaling Potluck Picnic originally scheduled for this coming Tuesday May 19 is postponed for two weeks until Tuesday June 2. I have updated the 2015 Bike Fun Calendar on the PPSP website to reflect this change. For the past several days, I’ve been keeping an eye on the weather forecast for this Tuesday. Although no rain is forecast, it appears that temperatures on Tuesday will only reach the low 50’s under partly sunny skies with gusty winds over 20 mph. Although these are not optimal conditions for bicycle riding, my main concern is that this is not the sort of weather conducive to enjoying a pleasant outdoor picnic. Since only three PPPPicnics are scheduled this year, I did not want to simply cancel. After considering various possibilities, I decided that rescheduling this PPPPicnic for June 2 was the best option. This keeps us scheduled on a Tuesday, it allows a couple of weeks for weather patterns to provide more comfortable temperatures, and it gives me time to spread the word about this new date for Bike Fun. I felt an early decision about this was best to give Poky Pedalers a better opportunity to learn the sad news about this Tuesday. On the other hand, there will be more Bike Fun to share in June, so that is certainly great news for all Poky Pedalers. Besides, you won’t have long to wait until our next Poky Pedal. The Bike to Shop Day Bingo Ride is on Saturday May 23. The combination of celebrating Bike to Shop Day while playing a shopping-based Bingo game as we progress through our ride creates the potential for an epic Poky Pedal. I’ll post more details about this unique flavor of Bike Fun on the PPSP blog in a few days. The PPSP blog is your best source for learning the status of upcoming Poky Pedals. It is always a good idea to take a peek in case there is anything special planned to supplement our Bike Fun. And if the weather seems uncooperative, I use the blog to communicate delays or cancellations or the lack thereof. Although the PPPPicnic for this Tuesday is postponed, Poky Pedalers still have a ton of Bike Fun to share in May. And don’t forget to mark your calendars for the new date for the PPPPicnic of June 2. See the schedule of Upcoming Poky Pedals and the 2015 Bike Fun Calendar for more info.